There is an old saying that says "Prevention is better than cure". That's indubitably correct. There is no guarantee when your phone may crash due to hardware or system failure which may cause deletion of all important contacts on your phone or even the worst case scenario, your phone may get stolen and you lose all information forever. Even if you are using some expensive phone with high specifications such as Samsung Galaxy, Google Nexus, OnePlus, HTC and so on cannot even get back the contacts into your phone if they are accidentally deleted. So, the best thing to do would be to back up your contacts list before you lose them. That way even if anything goes horribly wrong, you will be relieved to know that all your stuff is safely backed up and you can restore them. Fortunately, Gmail does offers to back up your contacts to its drive directly. The process is quite easy but for long shot, it is indeed efficient and helpful and you can be assured that your contacts are safe with Google even if they are erased from your phone. 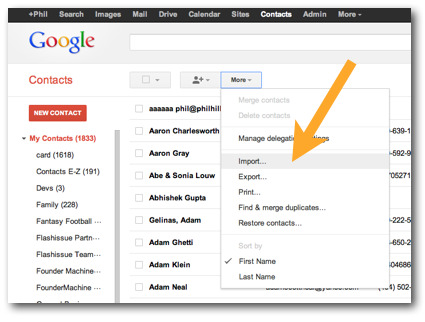 Please note that contacts will be automatically stored in Gmail whenever you sync your phone with it. So, if you sync contacts with Gmail anytime then it is assured that the contact list has already been added to your Gmail account. To add a Gmail account manually, follow this steps. Step 1: Go to settings by swiping down from the top of the screen and click on the gear icon from the top right corner. Step 2: Tap on "Accounts and Sync." Step 3 : Tap on "Add account" followed by "Google". Step 4: Touch on sign in and enter your Gmail login credentials. If you do not have an existing Gmail account then touch on "Create new account" then fill in the form to make a new account. Step 5: Next, click on sign in and tap on "Sync Contacts" and as soon it is done, tap on "Finish". This should perfectly save all contacts from your phone to the Gmail account. Now, if you want to backup Android contacts to Gmail manually from your computer then the process will be a bit different. Only apply the following method if you want to import all contacts to Gmail from your computer. Firstly, you need to open contacts application on your Android phone then tap on the menu button and click on "Import/Export". Then on the following option tap on "Export to Storage" and save all contacts to your memory card or phone storage device. Next, connect your phone to PC and copy the ".vcf" file on your computer. Or, you may keep the phone connected and use the following steps. Step 1: Go to Gmail.com and login with your email and password.. Step 2: Click on the drop-down icon from the top left corner that says "Gmail". Step 3 : From the drop-down options, click on "Contacts" followed by "More" and then click on "Import Contacts". Step 5 : You may now check your Gmail contacts folder and you will find all the Android contacts are visible on your Gmail account. In case you forgot the Gmail account, it is highly recommended backing up your Android contacts to PC. This will double sure the contacts are kept in safe place. You can do it in less than 2 minutes with the help of Android Assistant, which can transfer all kinds of files and data between an Android device and computer. Step 1: Download and install Android Assistant. Open the program by clicking "Transfer" tab on the main screen. Step 2: Open the program and connect your Android to computer via USB cable. Make sure USB debugging is on. Or the program can't scan the device. 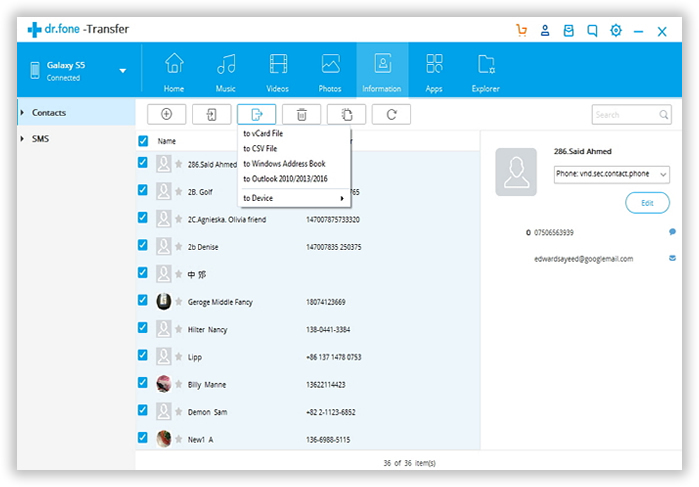 Step 3: Once the phone was detected, click on "Contacts" tab on the left sidebar and select the contacts you wish to backup. This is more flexible than the above two methods. A few seconds later, all the contacts will be saved to a local folder on the computer.